Junior is a dog with few cares or worries. Not much seems to ruffle his feathers. The word "laid-back" comes to mind. Mr. Hawthorne Makes His Smoked Salmon Dip. Mr. Hawthorne loves his new stove top smoker and looks for any occasion to use it. ... then spreads them out in the bottom of the pan. ... and puts 1 1/2 pounds of wild-caught Alaskan salmon in the pan. He smokes this at 210 degrees for about 45 minutes. I thought you'd like to know who caught my salmon. 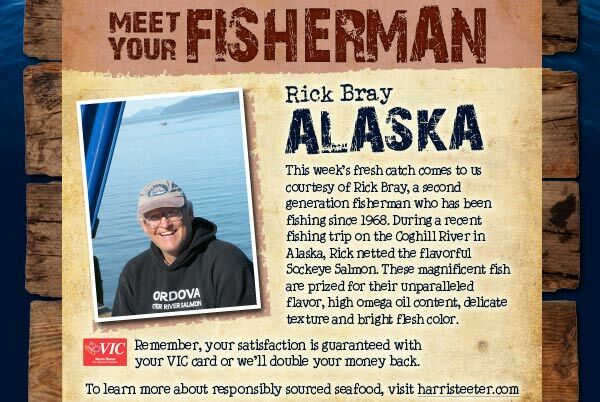 Rick Bray, a second generation fisherman caught this sockeye salmon on the Coghill River in Alaska. Remember, I do not like salmon ... yet, but I love Mr. Hawthorne's smoked salmon dip. Mr. Hawthorne's Smoked Salmon Dip 3/4 pound salmon 4 oz. cream cheese, softened 3 TB sour cream 3 TB mayonnaise juice of a whole lemon hot paprika Mix all together. That's some smokin' love on a tostito. Trust Rosie. I love a good stir fry. And that's exactly what I have in mind for lunch. I'm only using one pork chop for the two of us. The vegetables provide the bulk for this meal. Slice into thin strips. It helps if the pork is slightly frozen. Makes it easier to slice thinly. Unfortunately, my pork was past the frozen state. Mea culpa. First, I'm making a marinade for the pork. I took one of my frozen 1-inch cubes of ginger, nuked it, and squeezed it to get out the juice, then minced the ginger. Add in three-four cloves of minced garlic. Oyster sauce and soy sauce, with the garlic and ginger complete my marinade. I prefer to mix by hand. I need a chicken broth or stock. Lately, I've been using this McCormick's Chicken Base. A teaspoon in a cup of cold water. Stir to dissolve, then nuke a frozen 1-inch cube of ginger and press the juice in along with some garlic cloves. Add the cup of cold ginger broth to a heaping tablespoon of corn starch. The cornstarch is the thickening agent for this light, flavorful sauce which will envelop and coat the rest of the stir fry ingredients. Stock and cornstarch in the ramekin. Add in a couple tablespoons each of mirin and soy sauce. My mise en place. Marinated pork strips. Water chestnuts. Julienned carrots. Beans sprouts. Sliced mushrooms. Finely chopped garlic. Minced ginger. Sliced celery. Sliced onion. Sliced red and green pepper. Heat up your wok on high. Add a few tablespoons of peanut oil. I like to use peanut oil for the high smoke point. Add in the sliced shrooms. Stir fry for about a minute or two. That's my personal taste. I like my mushrooms browned. By the way, never salt your shrooms before or during cooking. This releases water and they will steam, not sear. Now start adding the rest of the veggies. Carrots. Just that fast over high heat. Stirring the entire time. Transfer veggies to a bowl and partly cover. I added a little bit of sugar to my marinated pork to help in caramelizing. Add a few more tablespoons of peanut oil in the wok and add the pork strips individually. High heat. Add in the chicken stock/ginger/Mirin/soy sauce/cornstarch down the side of the pan, very slowly, allowing it to cook and thicken on its way down the hot wok. Goodie bits of ginger and garlic going in. Add the vegetables back in and toss to coat. Serve stir fry over a bed of rice and top with bean sprouts. This is a whole lot better than what is served at the local fast food China buffets. And that's just wrong. Thanks to my dear friend Marion for sending me this gem. And, Marion, you guessed correctly. I certainly will be wanting that recipe. Rosie Makes Chicken Pot Pies. While rummaging through my freezer, I found this little chicken I'd bought on sale. I'm thinking individual chicken pot pies for the little Hawthornelets. $2.80 for a whole chicken. Not bad. Combine flour, salt, and baking powder. Drop in diced butter and coat with flour. With a pastry blender, work in the butter and shortening. When you're making a pastry dough, you want different sizes of butter flakes in the dough - from bread crumb to pea size. The smaller pieces make the dough tender. The larger pieces make the dough flaky. ... gathering the dough in a ball. Do not overwork the dough. Just gather and roll around until it's smooth. Cover in plastic and refrigerate for a couple of hours. I added maybe 3 TB butter to my pan and sauteed all the veggies for about a minute. Then I added in about 1/2 cup flour. Cook, stirring, for a minute. ... stirring and allowing the mixture to thicken. Add in 1/2 cup heavy cream. ... and the peas. Heat through. It needed more peas. If your filling is not as thick as you would like, you could sprinkle in some Wondra quick-mixing flour to thicken it up. Don't sprinkle regular all-purpose flour. It will clump unless you make beurre manie (bur mahn-yay) which is equal parts flour and butter. Knead the flour and butter together and whisk into your liquid. Parsley and thyme from the garden. Chop the parsley and strip the leaves off the thyme. Add herbs to the mix. Taste test. Season if necessary with freshly ground salt and pepper. I filled 5 1-cup ramekins and a 6 1/2-inch Corningware dish with the filling. Dust a little flour on your board, cut the dough into pieces, and roll out. Using an egg wash (1 egg mixed with 1 TB water), brush the outside of the ramekins so the pastry will seal. Cover the pots with the pastry, brush with the egg wash, and put a few slits in the top to vent. Bake at 350 degrees for about 45 minutes - until the pastry is golden brown and the filling bubbly hot. I really like this crusty dough. The thyme is a nice earthy touch. These didn't last very long. Put this on my comfort food list. Rosie Makes A Long Overdue Pizza. Rosie Is Pissed. But Then She Zenned Out. Pridefest On The Outer Banks. Pattypan And Yellow Squash Casserole. A Hint Of What's To Come. Little Junior. AKA Lil J. The Hawthornes' First Tomato Of The Season. The Hawthorne Menagerie, But Mostly Dogwood. Dixie And The Vacuum Cleaner. Dixie Has Wonderful Fun In the Pool. Rosie Makes A Sourdough Boule. Rosie Makes Her Corn Bean Tortilla Pie. Rosie Makes A Savory Galette Rustica. Rosie Makes A Very Berry Galette. Welcome To Rosie's Garden. Again. ISS Flies Over Outer Banks. Update On Pains Bay Fire. Smoke Update. Friday, June 10, 2011. Smoke. Thursday. June 9, 2011. Smoke From Pains Bay Wildfire. Rosie Makes A Smoothie. Mr. Hawthorne Cans! What Have The Hawthornes Been Eating? Sunday Morning Breakfast. Eggs Hawthorne. XKT And Rosie Have Dinner In Cambridge, Maryland. My Scribbled Notes About Nemours and du Pont. History of Nemours And The du Ponts. Part 15. Winterthur. A Replica Of The Mansion. Part 11. Rosie And XKT Visit Winterthur Gardens. Part 9.